Yes, you did read that correctly - Gruffalo mozzarella. In truth, it is just buffalo mozzarella, but I saw the sign when I was browsing and couldn't resist but pick up a couple of packs. 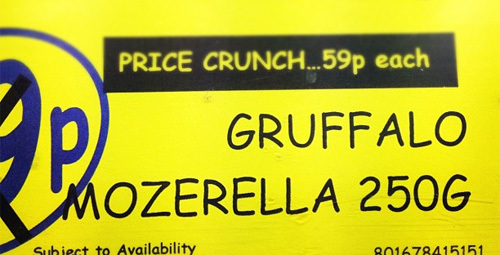 Whether it was a genuine mistake or the shop thought mozzarella came from Gruffalos, I'll never know. What I do know is that it seems a perfect way to get small children to eat something packed full of delicious vegetables - "but it's GRUFFALO lasagne for dinner tonight!". I certainly can't wait to try it out if I ever have children. 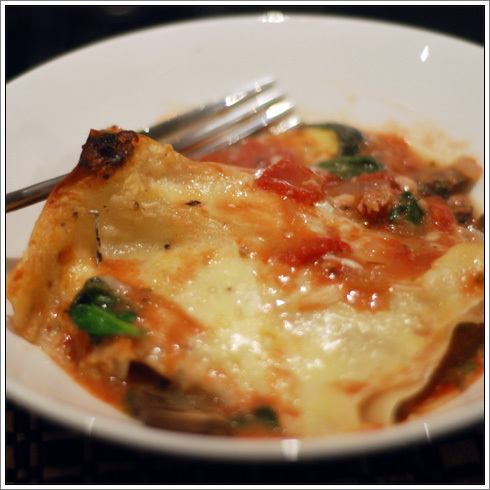 Vegetarian lasagne is one of my favourite winter treat foods, and I like mine packed full of vegetables. Mine is almost a very overblown parmigiana di melanzane with courgettes, spinach, mushrooms and of course lasagne sheets added in. I like the lasagne sheets to cook as it bakes and soak up some of the liquid generated by the spinach and mushrooms - it also gives a wonderfully crispy, more-ish top layer. However you can pre-cook your lasagne sheets if you'd prefer. It looks quite ingredient-heavy, but once you've made the tomato and bechamel sauces, it really is very simple - little more than an assembly job really! Start by making the tomato sauce: sauté the onion in a little olive oil for 2-3 minutes until they start to go translucent, then crush in the garlic and cook for a further minute or two. Don't let the garlic burn or your sauce will develop a bitter flavour. Add the chopped tomatoes, oregano and balsamic then simmer for about 15 minutes to allow the flavour to develop. Season to taste with salt and pepper. Next, make the Béchamel: melt the butter in a saucepan over a low heat, then stir in the flour. Stop stirring but let it cook for a further 30 seconds or so before adding the milk, slowly and steadily. I like to use a whisk to keep my bechamel lump-free as I add the milk. Once you've added all the milk, stir in the crème fraîche and mustard, then add the wine. As with the tomato sauce, you might want to add a little salt and pepper, or even a grind of nutmeg. Finally, begin assembling your lasagne. I used an oven-proof dish 25-35cm large. I also cut my aubergine and courgettes into about 6mm slices and then griddled them to add a gentle char-grilled flavour to the lasagne. Arrange the grilled aubergine over the bottom of your oven-proof dish, then spoon over 2-3 generous ladles of tomato sauce. Cover this layer with lasagne sheets, then ladle enough Béchamel sauce over the lasagne sheets to lightly cover them. Slice and then scatter the mozzarella over the bechamel, then slice the mushrooms and scatter these over too. Next, cover this layer with spinach. Cover the spinach with the grilled courgettes, then spoon the rest of the tomato sauce over it. Finally, add the top layer of lasagne sheets, cover with the rest of the Béchamel and then evenly scatter the grated parmesan over the Béchamel. Cover with foil and bake in the oven at 180°c for 45 minutes. 10 minutes before cooking time is up, carefully remove the foil from the top of the lasagne and let the top layer crisp up and the cheese turn golden. Think I might make this!